MANHATTAN THEATRE CLUB PRESENTS WILLIAN INGES CLASSIC PLAY! The Manhattan Theatre Club’s revival of American playwright William Inges classic play about a failing relationship that is on the verge of demise returns to the stage. The production began previews on January 3, 2008 and will officially open on January 24, 2008 at the Biltmore Theatre. Come Back Little Sheba is a heartbreakingly honest story about two people who started their lives together with so much promise and hope but twenty-five years later find that all that is left is a marriage of unfulfilled promises and broken vows. Lola is an aging beauty queen trapped in a lonely marriage to Doc a recovering alcoholic on the verge of falling off the wagon. Their already troubled lives are turned upside down when a beautiful young woman becomes a boarder in their cluttered home and unspoken passions are forced to the forefront. So many things have already gone wrong for this couple and the cards seem to be stacked against them. Can their marriage be saved or will this new addition to their unhappy home be the end for them? The production was first seen on Broadway at the Booth Theatre in 1950 winning a Tony award for Shirley Booth who later went on to win an Academy Award for her portrayal of Lola in the 1952 film version starring opposite Burt Lancaster. A 1977 television adaptation starred Laurence Olivier, Joanne Woodward and Carrie Fisher. The current production stars Emmy award winning actress S. Epatha Merkerson as Lola. Merkerson is probably best known for her long running role as Lt. Anita Van Buren in the popular crime drama Law and Order. She has been on the show longer then any other cast member appearing in 300 of the 366 episodes in the last fourteen seasons. She has also appeared in Pee Wee’s Playhouse and The Cosby Show. She was nominated for a Tony award for Best Featured Actress in a Play in 1992’s Pulitzer Prize winning play The Piano Lesson. The production also stars Kevin Anderson in the role of Doc. Anderson was nominated for a Tony award in 1999 for his portrayal of Biff in the revival of Death of a Salesman. His film credits include Sleeping with the Enemy where he starred opposite Julia Roberts, Hoffa and About Last Night. This talented actor has been an ensemble member of the Steppenwolf Theatre Company since 1984 and has starred in several of the company’s productions. Come Back Little Sheba is a powerful play with strong characters and tells an all too familiar story. It depicts a marriage that could have been so much more if life hadn’t got in the way. The remarkable cast makes this ticket worth it. If you are looking for a realistic drama then this is the one for you. Come Back Little Sheba tickets are selling for between $46.50 - $91.50 with premium seating and sold out Come Back Little Sheba tickets reaching over $200.00. 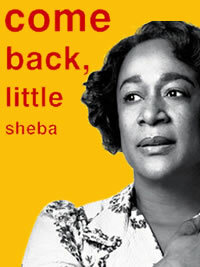 To view a great online selection of Come Back Little Sheba Tickets click the link!